Some alumni and friends came for the game; others came for the tent. Still others came to see friends and visit old haunts. 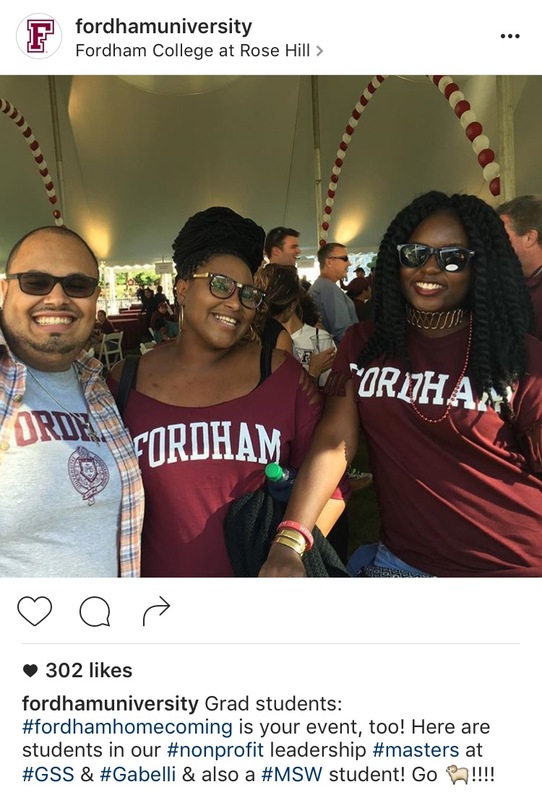 On Sept. 24, the annual Fordham Homecoming drew 7,800 to the festivities of food, drink, music, sports, and family fun. And the day did not disappoint. Fordham beat the Penn Quakers 31 to 17 as generations of Rams savored a Saturday noon meet-up, in ideal September weather, on a campus that still stirs hearts. 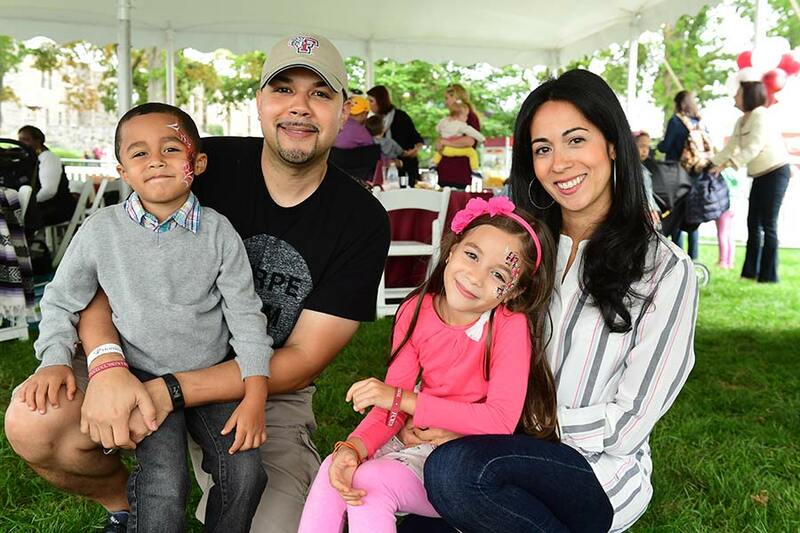 Inside the family tent, Alberto Vargas, FCLC ’99, Ana Vargas, FCRH ‘2001, their two kids, and friends and relatives had commandeered a table near the face painting. He recalled a day that changed his life, when his buddy introduced him to Ana at a McGinley Center dance. Both were C-Step students, and active in the Spanish club Grito de Lares. “He said ‘I’ve got this girl you should meet,’” recalled Alberto. “It’s strange, we met and we barely talked. But I asked her to dance and we danced the whole night.” Ana left an impression, because three years later, the two reconnected when Alberto asked his friend about “that girl with the braces” he’d danced with. Frank Stella, center, and members of Rainbow Rams. Around the periphery of the main tent, various tables offered signups and swag. One of the newest affinity groups, the Rainbow Rams Alumni Chapter, was sponsoring its first member drive. 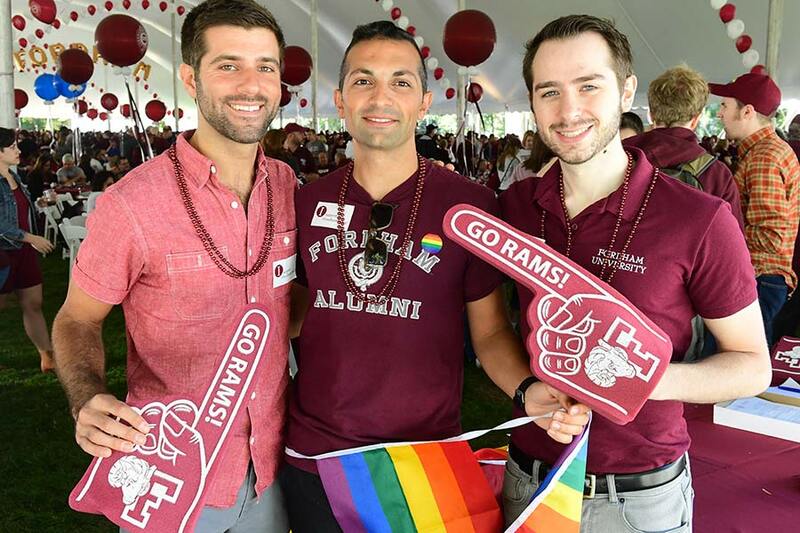 “It’s good to be part of the Ram family and also support who we are—Jesuit educated Fordhamites, and LGBT,” said Frank Stella, FCRH ’04. 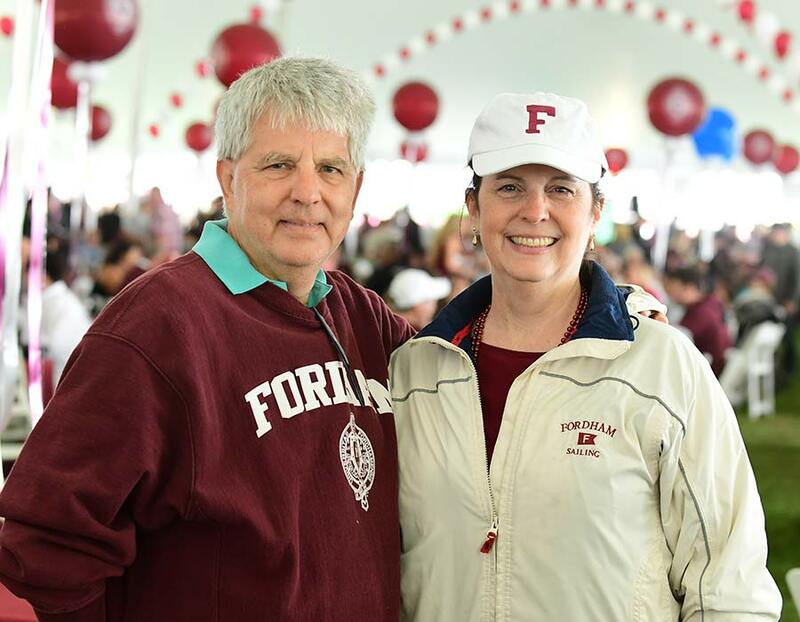 Jim Kastberg, GABELLI `85, and his wife, Joanne Krebs-Kastberg, GABELLI ’87, described themselves as sports fans, drawn to the game. 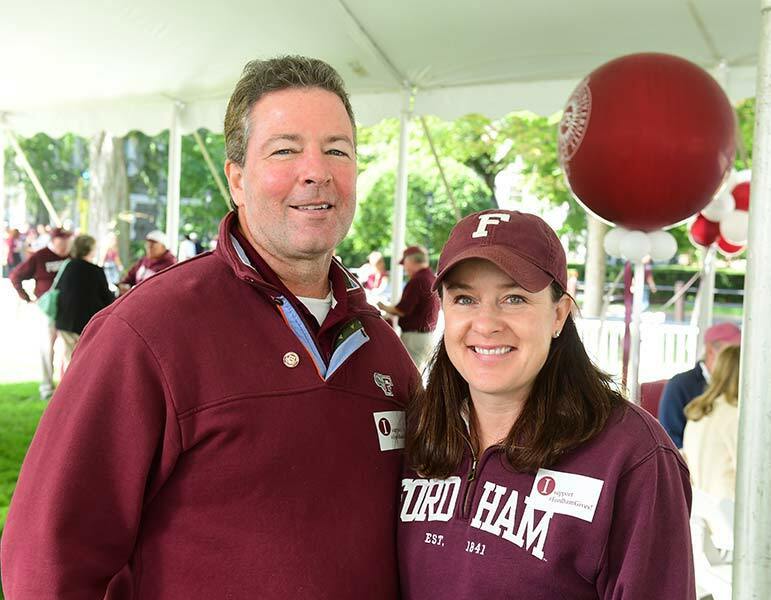 Kastberg, who played football all four years at Fordham, shared his own game memories, one of which was being “knocked out cold” during a 1981 homecoming game against U-Rochester after going head-to-head with another player. But there were more positive memories, too. “For two seasons, we got to play St. Norbert College at Lambeau Field in Wisconsin,” Kastberg said. “It was November and a freezing 10 degrees, but we were in a real NFL locker room” where the great Fordham alumnus Vince Lombardi had coached the Green Bay Packers to the Super Bowl championship. 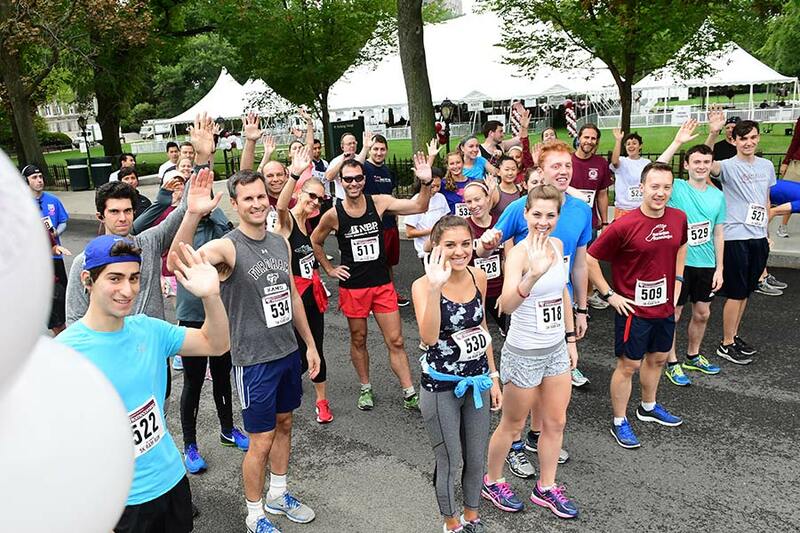 Earlier in the day, alumni and friends had participated in the Fifth Annual Ram Run. This year’s winners were Stephen Gan, FCRH ’14, in the men’s category, and Suzanne Forlenza, FCRH ’16, in the women’s category. Outside the tent, volunteer students manned a Gift of Life table to sign up donors for “Adam,” a 31-year-old in search of a match on the National Bone Marrow Registry. Graduate student Margaret Desmond, FCRH ’16, encouraged attendees to give a simple cheek swab; she said donating marrow is not as bad as one thinks. Enjoying the action from a distant bench overlooking Edwards Parade, Joseph Cacciola, FCRH ’06, pointed nostalgically to the window of his old dorm room, 418 Hughes, now the home of the Gabelli School of Business. “I like to come back to give back,” said Cacciola, a vice president at Warner Brothers Records who described with high regard the mentorship he’d received from his Fordham faculty. Cacciola hadn’t yet decided whether he was going into the tent, into the stadium, or over to his old hangout, Pugsleys. 5K to the Starting Line. 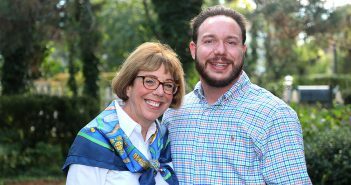 -Edward Wachowicz and Joanne Butler Wachowicz, parents of Mary, GABELLI ’10, John, FCRH ’13, and Anne, GABELLI ‘15, GSE ’16. “We at least make it to the tent,” Edward said. 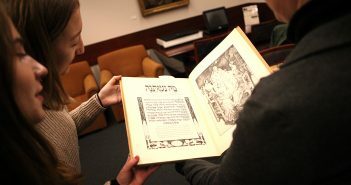 To see more photos, visit our Facebook page.